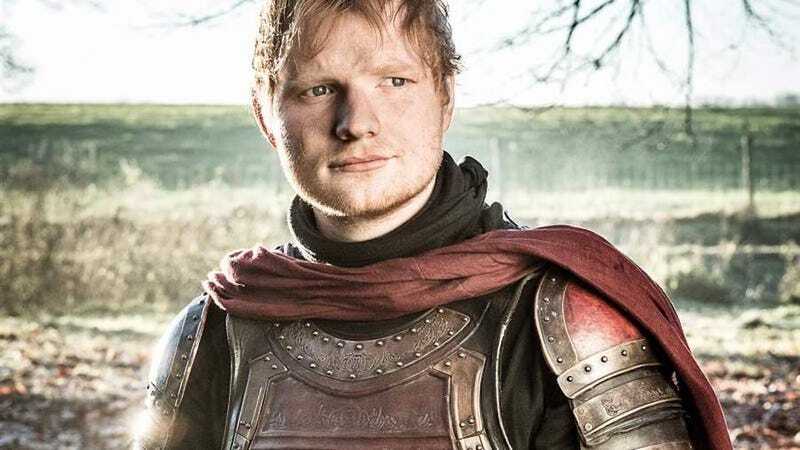 Ed Sheeran moonlights as a Grammy-winning singer and Beyoncé collaborator, but we know him best as Game Of Thrones’ ginger-haired troubadour, a character so controversial that Sheeran deleted his Twitter account following the cameo. Though the masses longed to see his freckles speared by Needle, the singer’s scene was instead a gentle one designed to humanize the Lannister soldiers ahead of their battle against Dany’s dragons. Director Matt Shakman disappointed the world when he said Sheeran’s character was nowhere near said battle, but last night’s premiere calls that narrative into question. As Jerome Flynn’s Bronn enjoyed one of King’s Landings’ numerous, ongoing orgies, two of his playmates chatted about a Lannister soldier named “Eddie” who not only was at the Loot Train Attack, but didn’t fare so well. It’s true. Sheeran believes his character is out there “chillin’,” but he’s also on record wishing he were “brutally, brutally murdered” so his haters would also be happy. Well, considering that having one’s eyelids burned off sounds like a fate worse then death, it appears everyone wins here. The world snoozing around him, we imagine No Eyelids Eddie watches the door, praying to the Seven-Faced God for a Faceless Man to end it all. This is Game Of Thrones we’re talking about. With that resolved, what horrors do we wish upon the Storm Trooper he’s said to be playing in Rise Of The Skywalker?